With the results having been posted in a previous post, it is now time to flesh through the details that led to the creation of this simple yet useful device. detailed pictures allowed me to understand how the remote control would operate. This is pretty simple, and I found that it could be easily interfaced with a microcontroller using just a pair of bipolar transistors to do the switching. I wanted to do it as simple and with the fewest components as possible, in order to make it an efficient and cheap device. As such I selected a pretty cheap microcontroller, the PIC12F683. While not being the cheapest of all, it is very affordable, and yet powerful enough for a variety of uses. More than enough for an intervalometer. I had however the problem of how to interface with the device, and tell it what interval setting I would want in each shooting session. As it had only 8 pins, from which only 6 available for GPIOs, I was quite limited in options. From the six available pins, I knew that 2 would be required for the camera interfacing, one for a push button to activate the triggering, and one for a status LED. This would leave me with 2 pins for the interval selection mechanism I would adopt. I could use some encoder switch, but the firmware would be a bit complex, and it would not retain the position after cycling the power (unless it would be stored in EEPROM). Another approach which seemed interesting, and one that I had seen from previous designs, was to use a 12 position rotary switch with a resistive divider. It would work a kind of like a potentiometer, but with discrete steps. As the PIC had an ADC, recognizing different steps would be a simple matter of adjusting the expected range of values in the firmware. Piece of cake! And this way we would have 12 distinct modes to select from. The selected transistors were a couple of 2N2222, enough for the low current necessary for the interface in the camera side. A 9 volt battery would suffice for a few tens of hours of operation. Without much optimization I obtained an average of 8 mA of consumption. 1 x plastic case to contain the circuit and battery. In my assembled version, the DC connector and power cable were added, so that both the camera and the intervalometer could be powered from the same supply. In this case I used a 2 Amp 5 Volt power supply from a Sony PSP, which suited just fine. In order not to damage the linear regulator with reverse voltages, the DC connector was put in parallel with the input. Given that this input is 5 Volts, there is a drop to approximately 3.5 Volts at the regulator output. Still this has proven to be enough to power the PIC and remaining electronics without issues. In a final post about this subject I will provide some info about how the firmware was written. I can mention that the first stable version of MPLAB X was used together with the Hi-tech C compiler for PIC 12 MPU's. 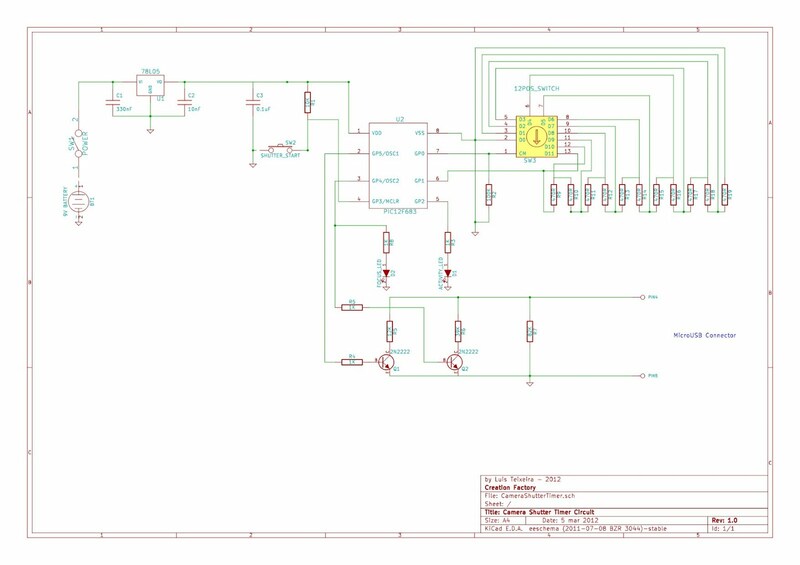 What software are you using, for drawing the schematics ? 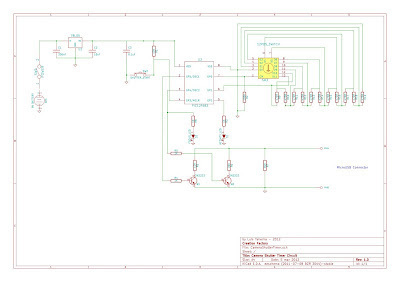 I am using KiCad EDA (http://kicad.sourceforge.net).